Chuck Foster hosts Reggae Central Sundays from 2-4 PM on KPFK. He features ska, rocksteady, dub, local and international reggae and dancehall with a special emphasis on roots music. Chuck is the author of Roots Rock Reggae: An Oral History of Reggae Music From Ska To Dancehall (Billboard Books, 1999) and The Small Axe Guide To Rockstedy (Muzik Works, 2009, updated 2016). He wrote the Reggae Update column for Beat Magazine for two decades and currently writes the Reading and Reasoning column for Reggae Festival Guide. 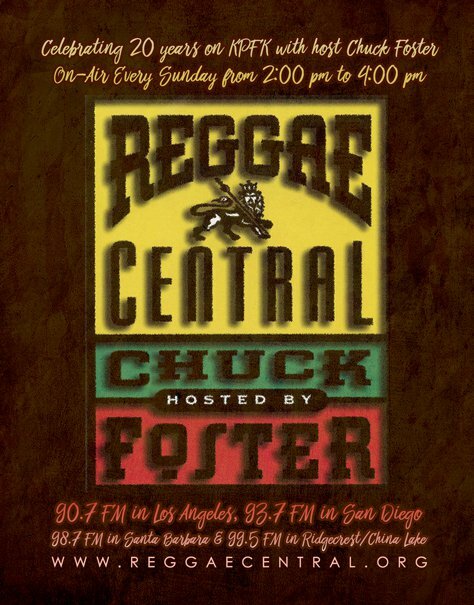 Chuck started playing reggae on the radio in Southern California in 1982 and began hosting Reggae Central in 1997. Live guests on the show over the years include Dennis Brown, The Mighty Diamonds, Burning Spear, Alton Ellis, Etana, Stranger Cole, Freddie McGregor, Phyllis Dillon, Lucky Dube, Morgan Heritage, The Expanders and many, many more.